Category: Bulk Herbs & Mushrooms, Wild Herbal Tea. Loose leaf herbal tea. A fragrant infusion of wild Arctic Rose petals and leaf, wild fireweed leaf, and spring spruce tips. 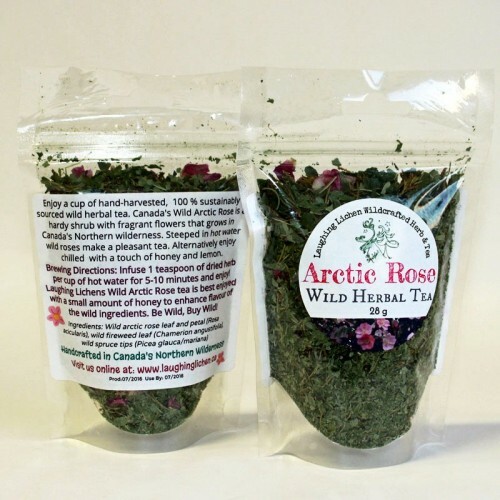 Enjoy a hot cup of Arctic Wild Rose Herbal Tea with a pinch of honey to to enhance the flavour. Alternatively enjoy chilled as an iced tea with a pinch of honey and lemon. 100% sustainably sourced wild ingredients from Canada’s Northern Wilderness! Ingredients: Wild Arctic Rose leaf and petal (Rosa acicularis), wild fireweed leaf (Chamerion angustifolium), wild spring spruce tips (Picea mariana/glauca).